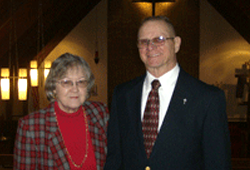 Arleigh and Mary Jane Jones, of Illinois, have been faithful supporters of Dakota Boys and Girls Ranch for years. In a generous act of stewardship, Arleigh and Mary Jane recently designated the Ranch as a beneficiary of one of their investment funds. As a result of this designation, Dakota Boys and Girls Ranch will receive a minimum donation of $100,000 for the ministry's work with at-risk boys and girls. The couple first heard of Dakota Boys and Girls Ranch from a former pastor, Virgil Kelm. They were sharing a cup of hot tea before a Sunday Bible class when Virgil sweetened his tea with honey from the Ranch. When they asked about the honey, he told them about the work of the Ranch, and of the organization's affiliation with the Lutheran Church Missouri Synod. Since then, they have visited all three Dakota Boys and Girls Ranch campuses, in Bismarck, Minot, and Fargo, N.D. Arleigh said, "We enjoyed our visit to the Ranch facilities and visiting with the staff. We were very impressed with everything we saw and cannot say enough about the fine people who showed us around. Everyone we met was absolutely 'top quality'." Arleigh and Mary Jane give to the Ranch because organizations like the Ranch have the opportunity to affect so many young lives. "The stories about the success of some of these young people are awesome," Arleigh said. "It makes us want to be a small part of their success. We are anything but wealthy, but have found that it is impossible to out-give the Lord. Somehow He continues to provide all we really need, so we continue to help organizations like the Ranch." For more information about Dakota Boys and Girls Ranch, and to learn how you can invest in the ministry, contact our foundation office at 800-344-0957 or J.Zinke@dakotaranch.org.